9 identical 4-cm cubes are placed in an empty rectangular tank of length 90 cm and width 25 cm. The tank is then filled with water from a tap flowing at a rate of 7 litres per minute. It takes 12 minutes to fill up 34 of the tank. What is the height of the tank? Correct the answer to 1 decimal place. The figure shows a tank made up of 3 sections. Cuboid A with a square base of side 4 cm and height 30 cm. Cube B with a side of 12 cm. Cuboid C that is 60 cm by 20 cm by 40 cm. Water from a tap above flows down at a rate of 1.2 litres per minute while water is drained out from the bottom at a rate of 1 litre per minute. How long did it take to fill up the tank to a height of 66 cm from the base? Give the answer in minutes correct to nearest whole number. Shemy placed three empty tanks side by side. The smallest tank has a crack at its side and the base area of each tank is 16 cm2. After she turned on the tap for 64 minutes, the height of the water in the smallest tank became 6 cm although 0.5 mℓ of water is leaking out of the crack per minute. Find the rate of flow of water from the tap. Give the answer in mℓ/min. A pool measuring 50 m x 25 m x 2 m was completely filled with water. The water was draining out of the tank at a constant rate and became completely empty after 25 minutes. What fraction of the pool was filled with water at the end of 24 minutes? Express the answer in the simplest form. How many litres of water was drained out of the pool at the end of 10 minutes? 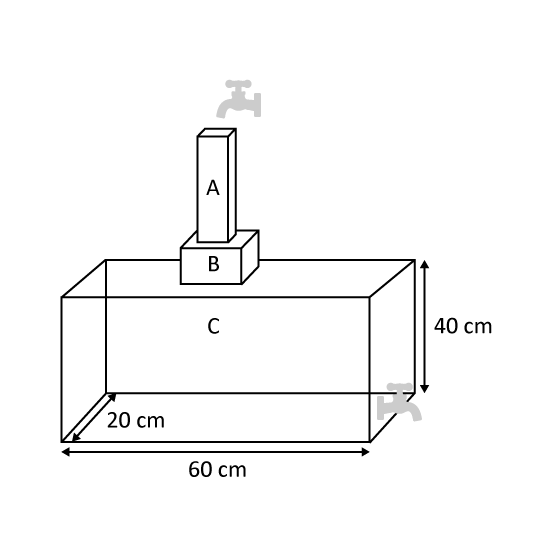 A rectangular container 100 cm by 50 cm by 45 cm was 20% filled with water. A tap was turned on to fill it up with water at a rate of 9ℓ /min. Every 30 seconds after the tap was turned on, an iron ball of volume 500 cm3 was added to the container. How many iron balls of the same volume would there be in the container when the container is 100% filled with water? This figure is not drawn to scale. 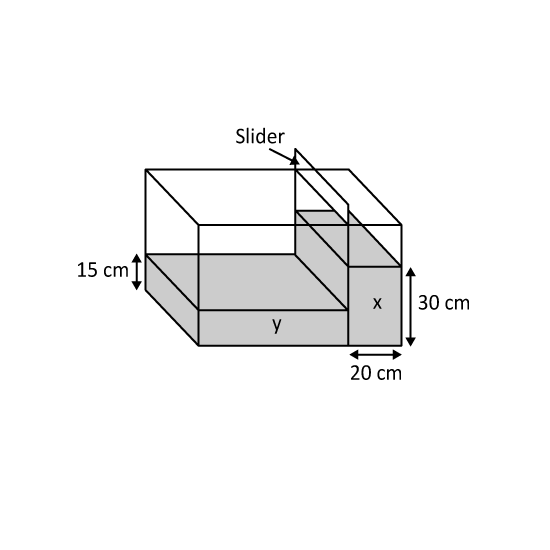 A rectangular glass tank 72 cm by 50 cm by 35 cm has 2 compartments, X and Y, with a water height of 30 cm in X and 15 cm in Y. A hole in the slider caused water to leak from X to Y. It was found that the water level in both compartments became the same after some time. What is the height of water in the tank now? It took 1 12 h for the water in both compartments to reach the same level. Assuming that water leaked at a constant rate, how much water flowed from X to Y in 1 minute? Express the answer to 1 decimal place in cm³. 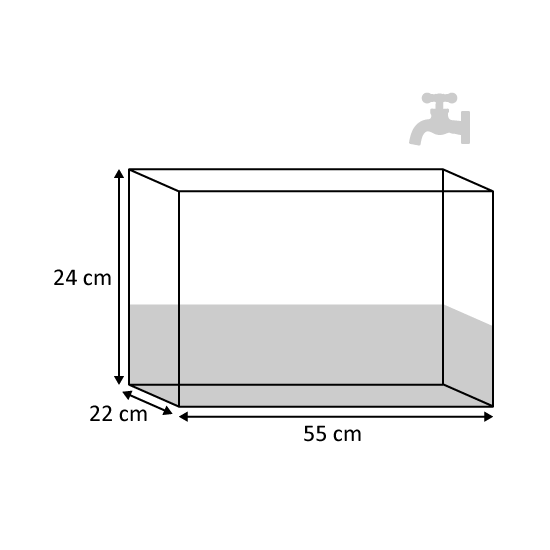 The figure, not drawn to scale, shows an empty tank measuring 20 cm by 15 cm by 15 cm. Water flows from Tap A at a rate of 300 mℓ per minute and from Tap B at a rate of 180 mℓ per minute. 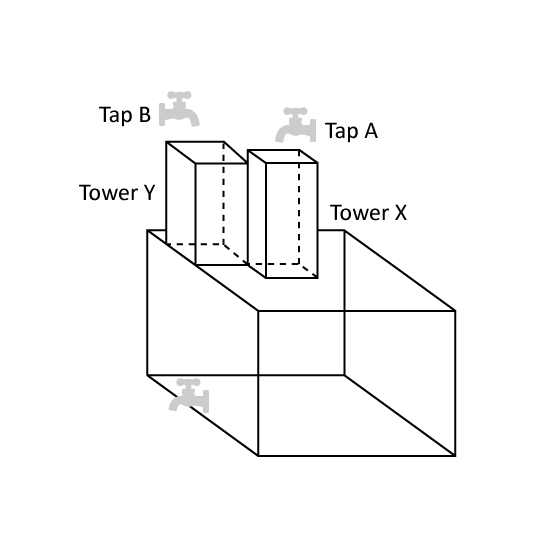 Tower X and Tower Y have a base area of 20 cm2 and 30 cm2 respectively. Water is drained out of the container at a rate of 130 mℓ per minute. Find the height of the water level after 13 minutes.